I have three small children and before I made the leap into DIY projects, I figured it was impossible to get anything done with little kids. In some ways I was right, but in many ways I was wrong. 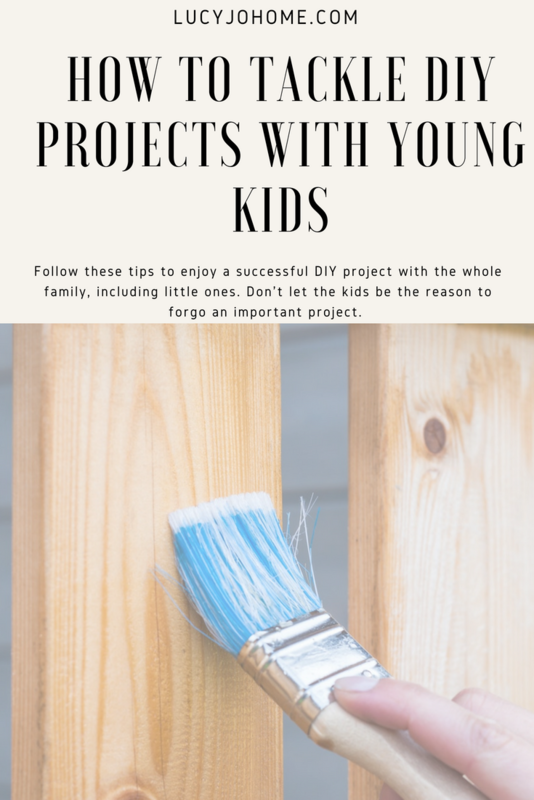 I want to share helpful tips on how to tackle home improvement projects with young kids. Prepare the rest of the house for the adjustment to the coming chaos. Keep all the other spaces in the house clean and tidy. Create a place for the displaced stuff while you make improvements in a room. This post is inspired by our recent experience of renovating our living room. Since it was a hub of the house, there was a lot of moving around and messes. I learned a lot about staying sane while so much was changing around us. If I had peaceful places to go, I could handle the construction zone elsewhere. Keep timelines flexible and realistic, but have a timeline. I thought painting our fireplace, creating builtins and painting the room would be quick and easy. I figured it would take a whole day. We are about two full days into the project and we still have another full day to go at least. If I was not flexible with my expectations I would be disappointed and stressed, which would filter into family life. My kids and husband are going to be happier if I can give a little on the end date of the project. Don’t neglect trying to keep a schedule though. Without a plan your project will linger far too long…like our stairway project. Involve the kids in the design process and workload. I remember having a cool conversation with my seven year old daughter about what I was trying to do when we renovated the basement. She got excited and started to help me paint. I know that the time I spent involving her in my excitement for the project helped her feel like she was a part of it and then I let her contribute. I also asked her opinion about some things. Even if I didn’t do what she suggested, she felt heard and involved. My 2 and 3 year old naturally didn’t care, but they wanted to help too. let them help with an easy aspect of the project like cleaning up the other parts of the house, helping more with meals or even taping or painting, depending on the project. The older your child(ren) is/are, the more they can help. For the little ones, maximize their nap times and remember that giving your child 15-20 minutes of undivided time can allow you an hour or two worth of work time, so slow down enough to enjoy your kids and know that time for the project will come. Consider rewards for patience and good behavior. We tend to bribe them with a treat and that works well. I hope these ideas will help you to have the confidence to start a project that seems daunting, but is important to you. The more support you have from the entire family, the less stress and headache during and after the project. If the whole family works toward the goal, the whole family will truly appreciate the end results. Don’t forgo improving your home because you think your children will not be able to handle it. Give them some ownership in the project and you will be able to do more than you thought.